WAHC is pleased to present Where There is Smoke as part of Doors Open, an audio-immersive installation featuring a multi-dimensional collage of women firefighters with a diverse range of experiences of being one (or a few) amongst many. 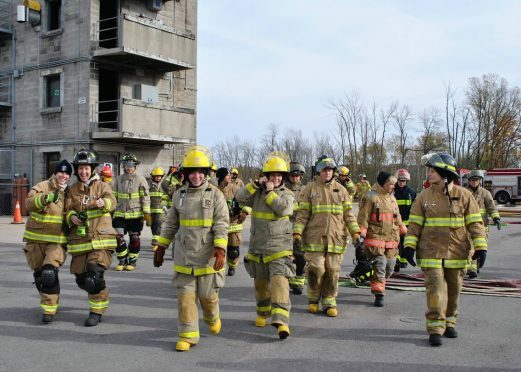 Created by Fire Service Women Ontario and Red Dress Productions, with the participation of 30 women firefighters in Toronto, Hamilton and Waterloo. Where There Is Smoke disrupts any presumed single narrative of women firefighters who represent 3% of firefighters in Ontario. By making space for these stories that intersect labour, art and equity, we hope audiences consider notions of community service, who does it and how it is done; and, the generative nature of socially engaged storytelling, art and media making as model for equity-building, and creating institutional culture shifts. Firefighters will be on hand to answer any questions you may have! We are open both Saturday and Sunday from 10 am to 4 pm. WAHC thanks Red Dress Productions and Fire Service Women Ontario for making this installation possible. For more info, call 905-522-3003 x 26.